Marble, granite, limestone, travertine, sandstone and slate are the most common natural stones used today. Other less common stones are onyx, flagstone and soapstone. Marble is a metamorphic rock that is best known for having veins. Although all marbles do not have them, all marbles will have calcite or dolomite. Ideal uses of marble are floors, furniture tops, bathrooms, foyers and hearths. Marble will react to acidic material and care programs are highly recommended to owners. Granite is an igneous rock that is known for its hardness and dense crystalline grain. The primary mineral in granite is quartz. Ideal uses of granite are floors and kitchen countertops and sidewalks if flamed. Granite will not react to acids like calcium containing stones, but should still be protected from stains and soil damage. Limestone is a sedimentary rock that is known to contain fossils. Uses include floors, countertops, and wall cladding. 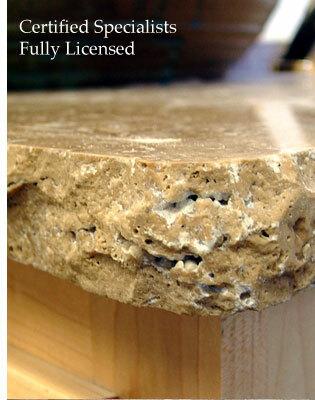 Travertine is a limestone that is best known for having holes. Polished travertine will have its holes filled with Portland cement. Popular uses of travertine are floors and wall cladding. Sandstone is a sedimentary rock and is best known for its sand-like appearance. Slate is a metamorphic rock that has earthy tones and sheet-like characteristics. Its uses include pavers, fireplaces, floors and roofing. Do use a rug or entry mat at every entryway to trap dirt. Don’t use vinegar, citrus or any acid-containing cleaners on marble, limestone, travertine or onyx material.